Miss Laura Stokes is a man with a mission. The wicked Marquess of Marstoke ruined her sister’s life and she will exact justice–even if she has to dress as a gentleman to do it. The Duke of Rothmore finds Mr. Lawrence McConnell a pest–until he discovers that he is a she–and then he cannot get the daring chit out of his mind. He must convince her to give up her vendetta–but can he also win her heart? This is a short story, not a full length novel or novella. Laura was a trifle bosky—and on the verge of a perilous situation. Truthfully, she’d enjoyed playing Lawrence McConnell so far. It was so freeing, being a man. She could stretch her legs, walk as fast as she wished, go where and do what she liked, ride fast and offer opinions on everything. No one told her to slow down, quiet down, sit down. No one worried endlessly about what people would think of her, like her mother would never cease doing. Oh, everything would have been easier, had you been a boy. No one smiled vaguely, grimaced slightly and retreated back to their sketching, like her sister. Except that her sister didn’t smile anymore. She didn’t draw. She didn’t enjoy her garden. She’d spent the last couple of months lurking in corners and trying to hide her tears. Her perfect, quiet world had been shattered by the wicked Lord Marstoke—and Laura had donned this disguise for the sake of revenge. She’d also donned it yesterday morning, with no chance to escape it since then. She’d made the mistake of attending a race with Geordie and Stuart. Those two, instead of returning to Town, had followed the racing crowd to a country mill, and insisted on celebrating their winnings with a night at a hayseed tavern. Today, when they’d finally got back, it was to find that young Mr. Bentham had summoned them all to hear some news about Marstoke. Which was why she was drinking again—slowly—and cursing the band that flattened her breasts beneath her clothes. She’d been wearing the thing too long—it had begun to cut into her flesh and rub her raw. “Where the hell is Bentham?” she growled, pulling at the band surreptitiously. “Be here soon, he said.” Geordie gave a negligent wave of his hand and called for another drink. They’d been told to wait in a private parlor at the George—and they’d found many of the young gentlemen from Rothmore’s candidate pool there before them. They all turned as the door opened and Laura gave another swift, unseen yank at the fabric under her arm. “What’s he doing here?” Stuart grumbled. Rothmore. Laura’s lip rose in a snarl that matched Stuart’s aggrieved tone. What was he doing here? Certainly not appreciating the lengths she’d go to just to impress him. 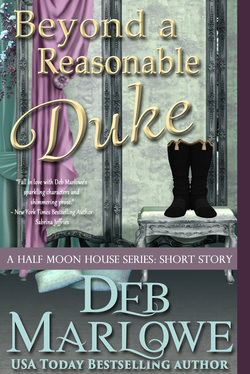 She and Jenny, her hired partner in this affair, had done their utmost to convince him to change his mind—and the damned duke had barely blinked an eye. She glared back. Why in blazes must he be so unflappable, so confident, so handsome? Suddenly furious—at herself as well as him—she stood up and moved away. She was tired and sore and tipsy and more than a little afraid that he’d never relent. So how dared he come around and act as if nothing was wrong? “Waiting on Bentham,” Geordie told him. That reconciled the rest of them to his presence quick enough. “McConnell, how about you?” the duke called. “No thank you,” she answered curtly. “You do sound annoyed,” Geordie offered helpfully. “You won’t have to,” a voice rang out from the doorway. “Bentham!” A chorus greeted the man as he crossed to the table. He took up the pint meant for Laura and toasted her with it. “What do you mean by that, Bentham?” Rothmore glanced back and forth between them. Laura, still leaning on the table, gasped. Triumph surged inside her. She let it shine through as she straightened, her mind already forging ahead, plotting planning. The others erupted in protest and debate. Laura was already inching toward the door. She didn’t care what Rothmore said—she was going after the marquess. She took another step—and realized that her movements were not causing pain. She looked down in horror. Her surreptitious tugging had loosened the damned band—and now it had slid downward inside her shirt, to bunch about her waist. Panic replaced the victory in her soul. She had to leave. She abandoned subtlety and headed for the door. Only to be yanked to a halt as Rothmore grabbed her arm. Despite the gravity of the situation, Laura laughed. Marstoke was finally going to find the tables turned. She wanted to see his face when Lawrence McConnell tricked him as thoroughly as the marquess had deceived her sister—and others, if rumor held true. Then Marstoke would be dead and McConnell would be gone—as if he’d never existed. His voice trailed off. Laura saw the truth hit, saw the moment he realized just what pressed up against him. His jaw dropped. He let her go as if her touch burned, stepping away as heat swept across his chiseled cheekbones and shock dulled his blue eyes. He stood, a statue amongst the uproar, staring dumbfounded as she slipped away.